Apr 17 - "April Meeting"
GRW is a member of the Texas Federation of Republican Women (TFRW), a volunteer army unmatched by any other women’s organization. TFRW makes it possible for women to influence how local, state, and federal government manages such critical issues as health, crime, education, taxes and financial security. 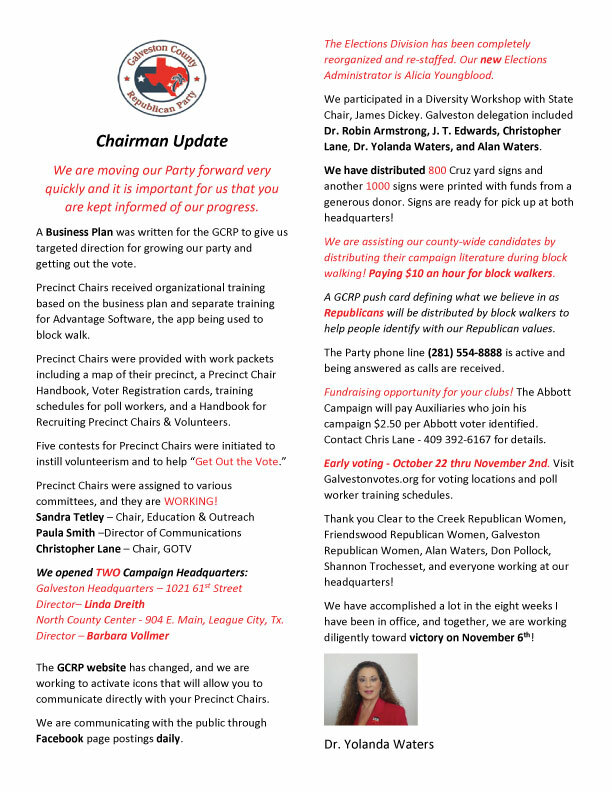 Political Advertising Paid for by Galveston Republican Women (GRW) PAC, Tina Kirbie, Treasurer – 908 Layfair Place, Friendswood, TX 77546. A Tax Exempt Organization Under Section 527 of the Internal Revenue Code. Contributions to the GRW PAC are NOT Deductible as Charitable Contribution for Federal Income Tax Purposes. Corporate Contributions are NOT permitted. Not Authorized by Any Candidate or Committee.